'Dying Of The Light': A Disputed Production, A Disappointing Product The film, disavowed by its director and writer Paul Schrader after clashes with the studio, stars Nicolas Cage as a CIA officer who believes the agency has lost its moral direction. 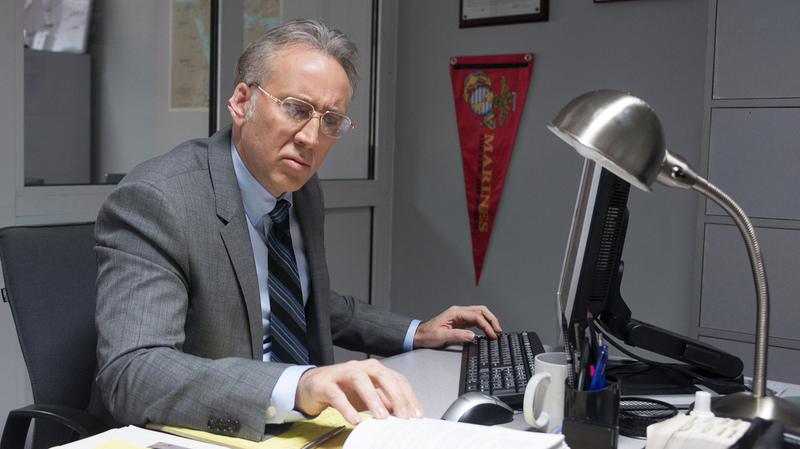 Nicolas Cage stars as rogue CIA agent Evan Lake in the spy thriller Dying of the Light. It's been a rough few weeks for Dylan Thomas. If Christopher Nolan's repeated use of "Do not go gentle into that good night" to portentously hammer home the significance of Interstellar wasn't lamentable enough, now comes Dying of the Light, which, title aside, takes a somewhat subtler approach in its appropriation of Thomas' poem, but does so to no less disastrous results. Normally I would have introduced the movie as "Paul Schrader's Dying of the Light," but the assignation became complicated in September when Schrader announced that the film had been re-edited, rescored and remixed without his participation. Schrader claimed he had been removed from the project against his will; the film's producers stated that Schrader had quit because he disagreed with changes they wanted to make to his first cut. Things escalated further in October when Schrader posted photos of himself, Executive Producer Nicolas Winding Refn, and stars Nicolas Cage and Anton Yelchin wearing T-shirts bearing the nondisparagement clause included in each of their contracts. The clause allows Lionsgate, the production company behind Dying of the Light, to sue if any of them make statements about the film that can be deemed derogatory, a clause that has prevented Schrader from speaking further about the film or his accusations. It's a sad but familiar turn of events for Schrader, who similarly clashed with producers when making Dominion: Prequel to the Exorcist. And given how his previous film, The Canyons, became defined largely by coverage of Lindsay Lohan's behavior on set, the debacle surrounding Dying of the Light also continues an unfortunate trend where conversations about Schrader — the writer of Taxi Driver and Raging Bull and director of American Gigolo — shift away from his actual films. That isn't to say, however, that Dying of the Light represents the best opportunity to adjust the lens and turn the focus back to the work. The film is so awkwardly paced, so slight intellectually, and so dull as a political thriller that the effort wouldn't do anybody any good. At its center is Evan Lake (Cage), a CIA employee who, 22 years after being captured and tortured by a Muslim fundamentalist named Muhammad Banir (Alexander Karim), receives two pieces of life-altering news. First, a diagnosis of frontotemporal dementia from his doctor, who warns that Lake will soon begin experiencing mood swings and pronounced losses of focus, among other symptoms. Second, intelligence suggesting that Banir, who has been presumed dead since Lake's rescue over two decades earlier, is alive in Kenya, though in very poor health owing to a rare blood disease. The CIA isn't much interested in catching Banir, though, so with the help of Milton (Yelchin), a CIA colleague, Lake decides to go rogue and find Banir himself. Schrader's claim that Dying of the Light was re-edited — regardless of the extent to which it's true — does get to the heart of what ails the film. Particularly in its last third, the movie's basic construction is conspicuously amateur. Rather than fluidly building to a suspenseful climax, the plot culminates with a spasmodic series of scenes that feel cut short or randomly inserted but never cogently weaved together. The rushed and often inchoate execution means there's little in the film that gets the benefit of more than a moment's reflection. That leads to a sometimes unbelievable plot — Milton at one point becomes an expert makeup artist in a matter of hours to help Lake surreptitiously meet with Banir. But it also leaves unexplored much of what, superficially at least, makes Dying of the Light seem interesting. This is, after all, a movie where the sinister terrorist villain is so ill that he can barely get out of his chair without help, and the cunning intelligence officer is on the edge of permanently losing his mental capacities. There's potential there, at the very least, for a twist on the action genre, but that potential is never mined. And whatever interesting political commentary might be contained in the premise is overshadowed by a vigorous patriotism concerned only with lamenting an America that has lost a vaguely defined set of "values." Lake first mentions these values in an inspirational speech to new CIA recruits, whom he commends for joining the agency even when people are declaring that it has lost all its moral bearings. But it soon becomes clear that Lake shares a similar concern; for him, the symptom of America's lost values is a CIA that doesn't pursue terrorists doggedly enough. It's not the politics that are distasteful here, but their abusively blunt expression. In one early scene, Lake blames the CIA's director for the Iran-Contra affair, Sept. 11, Benghazi, and more. Shortly after that tirade, we get a shot of a charred American flag that hangs in Lake's living room. A frail Lake pulls into focus, reflected in the flag's glass frame. Dying of the light indeed. Without a separate cut for comparison, or more detailed notes about what was changed, it's impossible to completely separate Schrader from the film, to determine what he would've done differently had he maintained full control. We can, however, refrain from judging his talents — or Cage, Yelchin and Refn's for that matter — based on a movie everyone acknowledges he did not finish. And we can regret the fact that a film Schrader wrote and directed is being released in a form that, for whatever reason, he regards as unacceptable. That, more than the mess that is Dying of the Light, merits criticism.